To complement the library’s upcoming major new exhibition in the Keith Murdoch Gallery, Victor Hugo’s Les Misérables: From Page to Stage (18 July – 9 November), some French rarities from the State Library of Victoria’s collection are currently on display in our permanent exhibition, Mirror of the World. 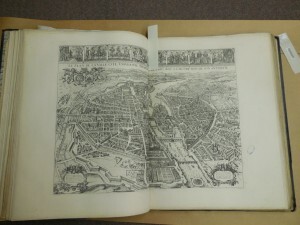 The Atlas des anciens plans de Paris (Atlas of ancient maps of Paris; Paris, Imprimerie nationale, 1800) shows the French capital as it was in the medieval period, a walled city surrounded by farmland. This atlas, along with other books recording the administrative mapping of Paris, was donated to the people of Victoria by the French Government in 1881, following the International Exhibition that was held in Melbourne. Also part of this donation was Charles Marville’s Photographic Views of Paris, which recorded the city before, during and after its modernising renovations (1853–70) by Baron Haussmann, Napoléon III’s chief urban planner. Two original Marville prints are on display in Mirror of the World, with 27 others on display in Victor Hugo’s Les Misérables: From Page to Stage. Although the city of Paris changed radically during Hugo’s lifetime, its remodelling coincided almost exactly with the period of his political exile from France, as an opponent of Napoléon III (1851–70). Les Misérables was written between 1845 and 1862, but is set 1815–33, in a vanished city. To populate his vision of this lost Paris in his great novel, Victor Hugo drew on established character ‘types’ that embodied generic figures of mid-19th-century French society. Such character types were instantly recognisable to Hugo’s original readership, having been popularised by illustrated French encyclopaedias published from early 1840s onwards. These books frequently reproduced images that were derived from earlier (often 17th-century) sources. 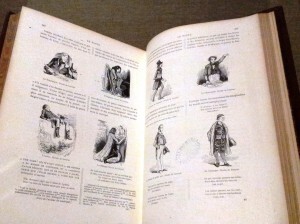 A volume of one such encyclopaedia, Les Français peints par eux-mêmes; types et potraites humoristiques a la plume e la crayon (The French painted by themselves; types and humourous portraits in pen and pencil; Paris, J. Phillippart, c. 1877) is currently on display in the Mirror of the World. It was edited by Honoré de Balzac, one of Hugo’s contemporaries and himself a major author. It features drawings, such as this humourous typology of poets, by Paul Gavarni, Jacques Callot, Jean Louis Ernest Meissonier, and many others. 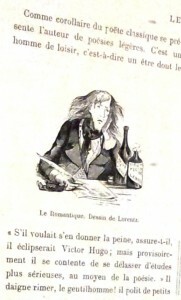 The description for one, ‘The Romantic’, cheekily claims “He assures us that, if he (only) took the trouble, he would eclipse Victor Hugo; but for now he is content to relax by writing more serious studies, through poetry.” The caricature bears more than a passing resemblance to some famous portraits of Hugo, head in hand, which can be seen in Victor Hugo’s Les Misérables: From Page to Stage.